The brows got a little more furrowed.The nose got longer and the nostrils deeper. The flared outer parts of the nostrils got tidied up and better integrated with the face. The lips and jaw had the planar brush lightly applied to them. For the lips this had the effect of creating a stronger edge to the lip line, better delineating the change from lips to surrounding flesh. For the jaw, this was a subtler change, removing a little of the curvature in the flesh, unifying the angles and giving the suggestion of bone along the jaw line.This is particularly noticeable in the middle image above. The ears received a few tweaks in front and a significant amount of trimming in the back. At a certain angle (one I commonly use in goblin paintings) the upper rear of the ears had proven to be too chunky. By creating gentle slopes from the top and bottom rear of the ears that thickened toward the center I created the slimmer profile of ears I was used to but with a solid connection to the head that made it believable that the giant ears could be supported on the head rather than tear off under their own weight (ouch)! The skin around the eyes was changed to compliment the alterations around the nostrils and bridge of the nose. The skin of the cheeks that is forced upward due to the goblin’s smile was better blended with the upper lip. The previous version was a little too pronounced making the cheeks feel more like a significant protrusion than just cheeks pushed up and out in a smile. The mouth was hollowed out more in preparation for the addition of teeth, gums and tongue. That’ll be stage four! Yeah, even though at first glance the changes may appear to be minimal, there’s actually a lot of tweaks going on. And there’s at least one more detail pass to do before moving on to a texture pass. Just look at this close-up to see that I’m still working on a relatively low resolution sculpt. The polygons are easy to spot. Finally, here’s a color test I tried out. This is just a proof of concept; a rough pass to see how a colored version might look. The eyes are especially bad at the moment as I’ve yet to learn how to use more than one material in a sculpt. The eyes obviously need to be more reflective as they’re currently quite dead which makes them bloody creepy, but not in a good way! Another drought of posts invariably means I’ve gotten busy with work. But hey, work = paying bills = well, you get the picture. I’ve had only a little time to try out more sculpting with ZBrush. The goblin head got a little more detailed and I’ll share that with you soon. 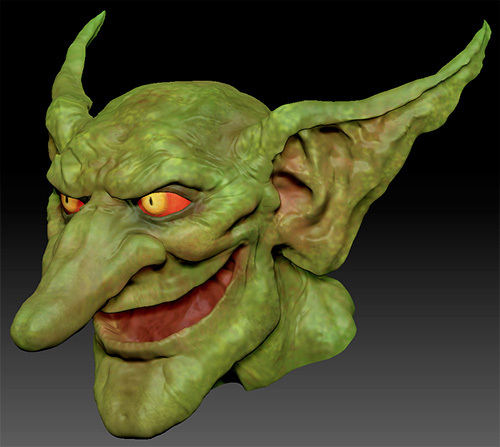 Some people have asked if I’ve considered using 3D printing to make the goblin head a physical reality. You bet I have! But I’m not going to jump into that until I feel I know what the hell I’m doing so that when I make the sculpture available, it’s worth people’s pennies. Chances are that when it comes time to make the sculpture, I’ll use Kickstarter to produce it. Seems like the best way to reach people worldwide and ensure the production run isn’t horribly over or under stocked. Here’s a link to someone who’s managed to really capture people’s attention on Kickstarter with a 3D printed sculpture. It’s a beautifully ornate skull. He started with the hopes of raising $500 and he presently stands at just shy of $34,000 with 30 days left to run! Just look at the static image for his video, that’s just damn cool and sells the piece before he’s even said a word. Besides the beautiful design, I think the subject matter appeals to a wide audience and that’s fueling this amazingly successful endeavor. I don’t think a fantasy based sculpt could hope to come close to that kind of total. Though I’d be happy to be proven wrong. Switching gears, but still sticking with Kickstarter, my wife Jillian, better known as the Lady of the Manners from Gothic Charm School is helping out on an indie coming-of-age goth movie called ‘My Summer as a Goth’ and they’re also raising money on Kickstarter to help with initial costs. One of the donation rewards is a part in the movie! Anyway, check it out here. It’s for a company I’ve never worked with before. The stuff I’m drawing for them is probably one of the last things you’d ever imagine me doing. …Aaaaaaaand that’s all my NDA will allow at the moment. Okay, back to work! While 99% of the stuff I’m working on at the moment is either not ‘ready for primetime’ or secreted away under an NDA, I continue to dink around with ZBrush, trying to add 3D modelling to my skill set. You might ask “Why”? Well, having a broader skill base never hurts. Also, sculpting is fascinating to me as I’ve limited myself to 2D works up until now. And that’s the primary reason for tackling a goblin head; I’ve drawn goblins in Magic for 15 or more years and while I think I’ve got a pretty good handle on how a Venters-style goblin looks (presumably better than anyone else! ), it’s fascinating to test the nebulous 3D object I hold in my mind against the hard reality of a 3D sculpture. It’s been especially interesting seeing how the over-sized nostrils interact with the giant nose and the minimal upper lip. And the ears continue to be a warzone of polygon brutalization to achieve some of the shapes found in the soft tissue. Anyway, this is not quite the goblin head you saw last time. I encountered some issues that couldn’t be fixed without generating bad polygon distortion so I took it back to the initial Zsphere sculpt and rebuilt. At this point, the sculpture is significantly more developed than the last one you saw, with more shaping and detail. Also, eyes and eyelids have been added and the mouth has been opened a little further to allow for an upcoming display of some damn-ugly teeth. Prepare your scrolling finger… NOW! 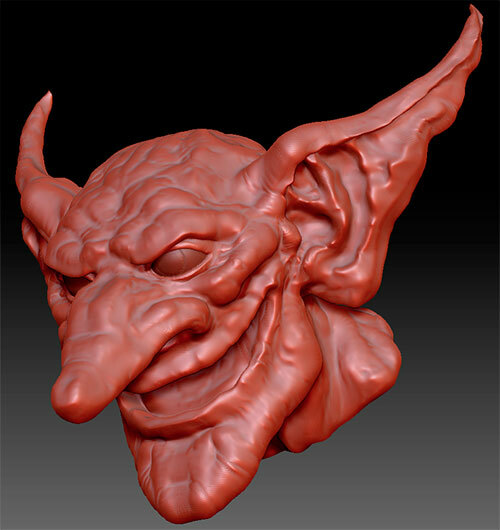 Oh, the other reason for all of this… ZBrush is a blast. I’m still grabbing time to try out Zbrush when I can – which isn’t much – and Eric Keller’s book continues to prove to be invaluable for navigating my way through the complex interface. Well, I just got to try out ZSpheres and ZSketch and the appropriate tutorial is about creating a new dragon and I thought, “Hey, I like a dragon as much as the next artist but I think I want to try something else.” And of course, being me, that ‘something else’ had to be a goblin. In what time I can grab, I’m trying to learn the amazing 3D app ZBrush. Just follow that link if you want to have your mind blown. When I can, I’m digging through the tools and the (intimidating) interface via a book called Introducing ZBrush 4 by Eric Keller and kudos to Eric because the very first tutorial is making a dragon head! 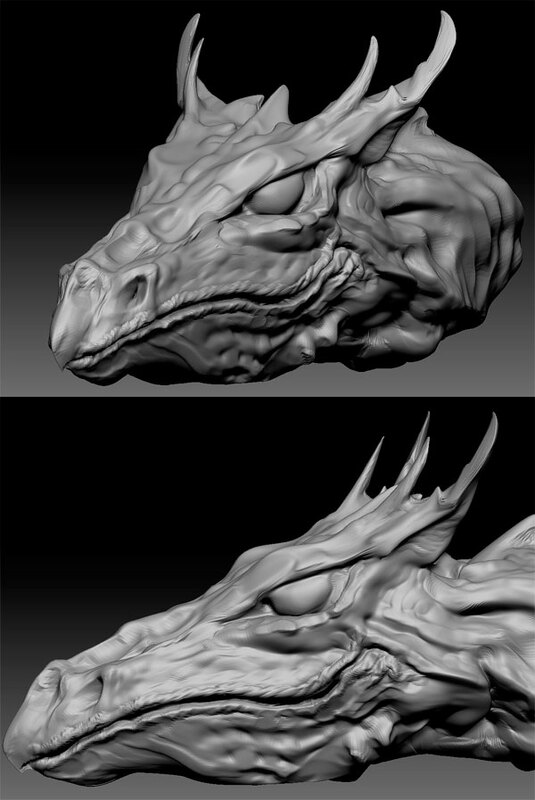 So, here’s my first ever ZBrush sculpture, a dragon head. It’s probably 50% done; it’s lacking real detail and textures. I won’t be going any further with this version as I ran ahead of myself and made some errors which, frankly, it’s easier to start over than to fix. But hey, it looks cool. I really like the way that he looks like he’s smiling until he’s looking straight at you then he looks really pissed off!